The world’s largest pizza brand is changing simple pizza boxes into Red Reading Boxes in Africa as part of the Pizza Hut African Literacy Project. Pizza Hut is a brand full of “firsts”. The world-renowned pizza was the first item ever to be ordered online, was the first to be delivered to the top of Mount Kilimanjaro and was truly out of this world when it became the first pizza to be delivered to space. The sky clearly isn’t the limit for this pizza giant that this year opens it’s 100th store in Sub-Saharan Africa and launches the Pizza Hut African Literacy Project to help make a real impact on the continent. Pizza Hut Africa’s new literacy mission is in line with the brand’s global initiative established in 2016, The Literacy Project, to raise awareness for literacy-related issues and engage consumers to help make a difference. In its first year, the global campaign impacted 15.9 million people and distributed more than 275,000 books and educational resources to communities in the U.S., Brazil, Canada, Costa Rica and South Africa. This April, General Manager of Pizza Hut Africa, Ewan Davenport and his Slice of Africa team will visit restaurants across the continent in the shape of a great, big pizza slice to mark the launch of Pizza Hut: The African Literacy Project. Instead of delivering pizza, they will deliver Pizza Hut Red Reading Boxes from NGO partner the READ Educational Trust and explore the innovative literacy tools they contain with local children in each country. What is a Red Reading Box? The Red Reading Boxes were created to give children a reading kit and include stationery, books, games, puzzles and cards. All of the items are carefully designed to help children build literacy, from recognising words on a card to picking up a book and experiencing the sheer joy of reading. 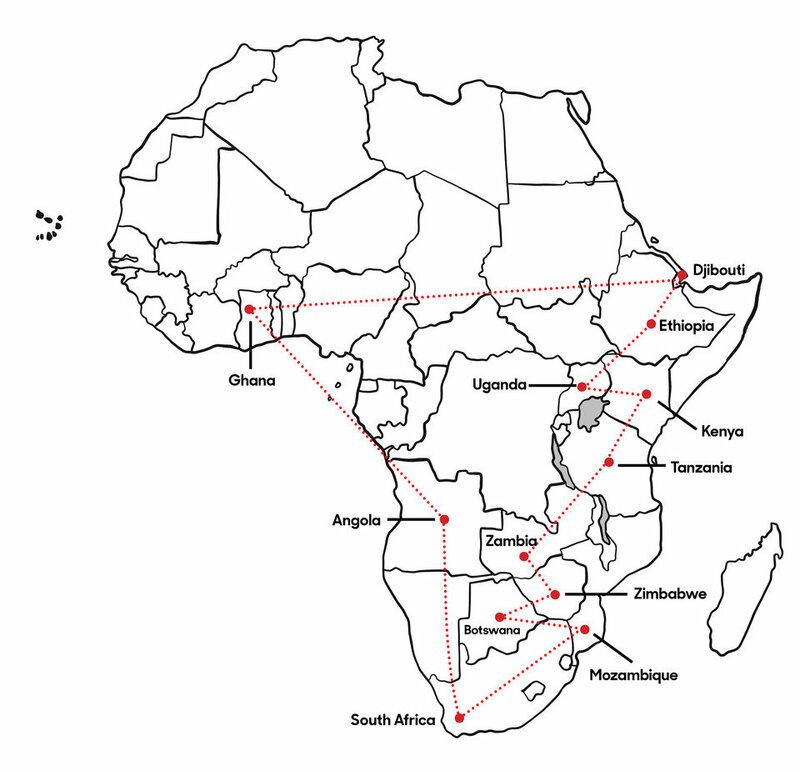 Davenport and his team will share this experience while taking Red Reading Boxes to 14 cities in 12 countries in 22 days, starting in Cape Town, South Africa and travelling to Accra, Ghana on the East Coast, across to Djibouti on the West Coast before completing the journey in Durban, South Africa. This campaign also bridges the cultural and linguistic divide by collecting stories at every stop that will ultimately go into a special Africa Edition of the Red Reading Box to be distributed across Africa on World Literacy Day. As they travel, the Slice of Africa team along with Pizza Hut franchise partners will launch a customer donation drive in each country to raise funds which will be combined with Pizza Hut contributions to roll out as many boxes as possible. Pizza Hut patrons and the public are able to be part of the “Slice of Africa” project along the route by donating both in store or online. Every cent that gets donated in a country will go to creating Red Reading Boxes for children in that country, which Pizza Hut plans to distribute on World Literacy Day in September this year. Davenport and his team begin their journey to deliver a “Slice of Africa” on the 4th April 2018. Pizza Hut, a subsidiary of Yum! Brands, Inc. (NYSE: YUM), has more restaurant locations in the world than any other pizza company. Founded in 1958 in Wichita, Kan., Pizza Hut operates over 16,700 restaurants in more than 100 countries. Pizza Hut is also the proprietor of The Literacy Project, an initiative designed to enable access, empower teachers and inspire a lifelong love of reading. The program is rooted in the foundation set by the Pizza Hut BOOK IT! Program in the U.S., which is the longest-running corporate supported literacy program, impacting more than 14 million students each year. For more information, visit www.pizzahut.com.